Ear cuff which used beautiful and large-sized Swarovski so as to be inhaled. You can easily fashion by just wearing one ear. A large-sized Swarovski crystal designed by imagining a jellyfish (jellyfish) decorates the ears. A circular Swarovski crystal shines brightly at the ear with fluctuation. It is attached to the upper part of the earlobe and ear, and since it has silicon attached to the catch it is hard to hurt, and the strength of the spring is firm, so it is hard to fall. You can also use it for formal scenes, not to mention being worn from everyday. It is wonderful to put it together with ear hook. ★ Please choose the color you would like from ★ Please inform us from the remarks column when purchasing ※. 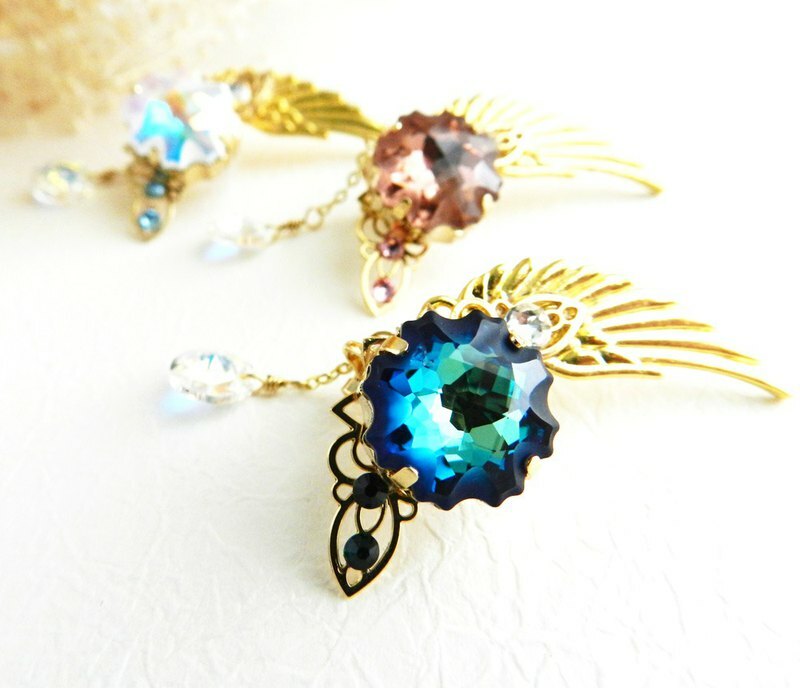 · Bermuda Blue (blue) · Crystal AB (Aurora) · Brush rose (pink) ◆ Size · · · about 3.5 cm ◆ Material · · · Swarovski crystal (light transmittance: 93%), main body (plating processing) ◆ Production: Order production. 【please note】 * If you are allergic to metal please refrain from purchasing. * The product is for the right ear. * Since the ear hook part is plating, please refrain from purchasing metal allergy. * The color may look different on the screen and the real thing. If you have any questions, please contact us. * When ordering multiple works, there are cases where actual shipping fee and some errors may occur. Please note. * Accessories are very delicate. Applying excessive force or getting wet with water may cause discoloration or damage, so please be careful about handling.